Fired ceramic does not withstand thermal shock nearly as well as other materials like steel, plastic, wood, etc. Ceramic is hard and resistant to abrasion but it is brittle and propagates cracks readily. Common ceramic materials that have low thermal expansions or impart a chemistry useful in the firing of low expansion products are petalite, cordierite, molochite, pyrophyllite, mullite, talc, spodumene, zircon. One company marketing such products classifies these under the umbrella: Thermal and Shock. Survival of thermal stress can take various forms. If a ceramic simply does not expand on heating and cooling in the temperature range at which the stress is being imposed, it will of course not fail (even though it might have high expansion at other temperature ranges). Or, materials that normally might crack resist doing so because the object made from them is sufficiently thin walled, smooth surfaced and has an even cross section without any sharp contours (these deny cracks a place to start). Another strategy is to make sure the thermal expansion of the glaze complements the body. When bodies are fired to a high degree of vitrifiction they become more brittle, thus a thermal shock prevention mechanism can be to simply fire lower producing a body of less density. Or if the microstructure of the material has alot of pores and aggregate grains, these will act as micro-crack terminators, that means that the substrate of the material will develop a resilience to heat shock that is a product of a crack network within (overall loss in strength is associated with this but sometimes it can be tolerated). An interesting example of this is terra cotta ware made by indigenous people around the world. The open porous nature of the substrate that is a product of the very low firing temperature gives it the ability, in many cases, to even survive an open flame. Of course the natives using these vessels know that the down side of this is that the ware has very poor mechanical durability and cannot be glazed, but they accept this tradeoff (actually in many cases they do glaze it using lead compounds). Ceramic substrates are typically high in quartz and quartz grains experience high expansion and contraction through quartz and cristobalite inversions. Thus where an application demands thermal shock resistance in these temperature ranges, the body must not have undissolved quartz grains in the matrix. Alumina is a similar situation. It too is refractory, but it does not have good thermal shock resistance at higher temperatures (whereas at lower ones it is better). Thermal shock failure can take on different forms. If typical vitreous porcelains are subjected to an open flame they will simply explode into shards. As their resistance improves they might simply crack in half. Or they might crack, making a distinctive ringing sound, yet on inspection that crack is not visible (but they will have lost the distinctive ring when tapped with a metal object). 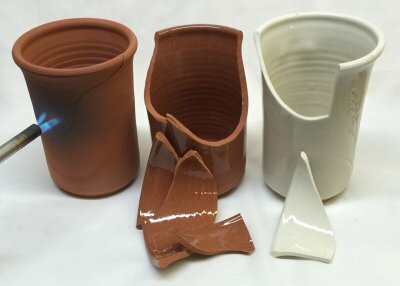 Some fired ceramic items can withstand many successive thermal shocks but, over time, they gradually weaken and eventually fail. Some materials that can survive sudden heating do not perform as well with sudden cooling. This typically happens when the item is glazed. 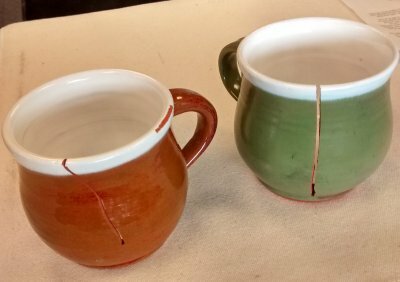 It is common for the stresses of the glaze shrinking before the underlying body to cause the glaze to crack (called crazing), but the cracks do not propagate through the body. 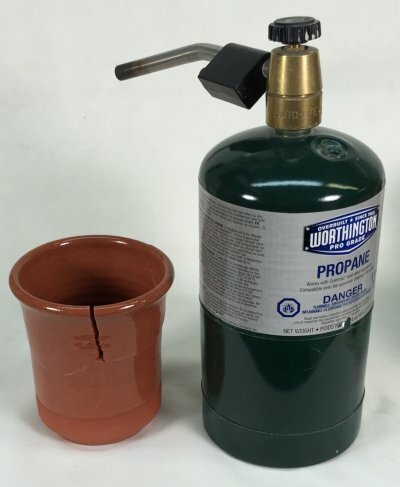 It is fairly easy to test ceramic items for their ability to resist the thermal shock to which they are likely to be exposed. 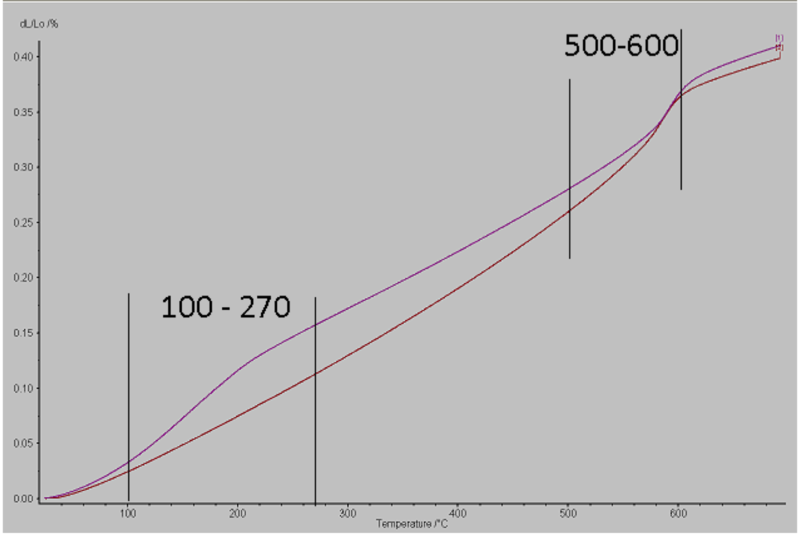 An example is a boiling water:ice water test, or a 300F to ice water test. 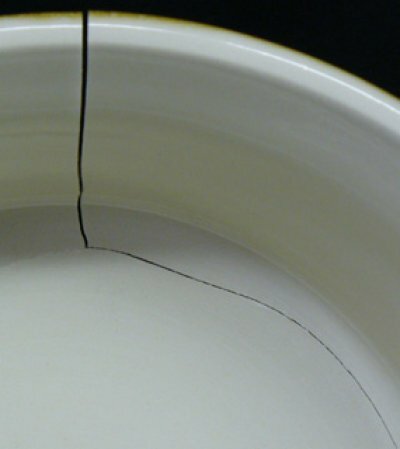 Example of a dunting crack in a flat deep cone 6 porcelain bowl. The bowl has a wide bottom that heat-sinks to the shelf, so during firing there is a temperature gradient between the walls and the base. 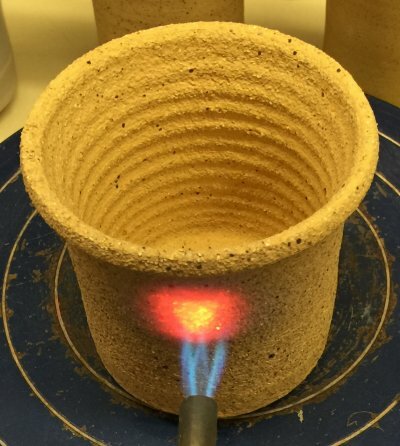 That difference in temperature translates to stress because it means that different parts of the piece are experiencing different thermal contractions as it cools in the kiln. This is due to its inability to withstand thermal gradients across its width. Sintered alumina is refractory, but it is not thermal shock resistant. The vessel on it was being used to calcine clay. The inner part of the shelf was being protected from the rising heat because of this heavy, slow-to-rise vessel on top of it. The moment of the crack was so dramatic that, in spite of the weight on top of it, the shelf blew apart leaving 4 pieces with an inch-gap separating them. Can you make things from zircopax? Yes. 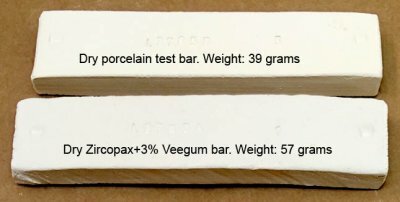 Only 3% Veegum will plasticize Zircopax (zirconium silicate) enough that you can form anything you want. It is even more responsive to plasticizers than calcined alumina is and it dries very dense and shrinkage is quite low. Zircon is very refractory (has a very high melting temperature) and has low thermal expansion, so it is useful for making many things (the low thermal expansion however does not necessarily mean it can withstand thermal shock well). Of course you will have to have a kiln capable of much higher temperatures than are typical for pottery or porcelain to sinter it well. Can you throw zircopax on the potters wheel? Yes! 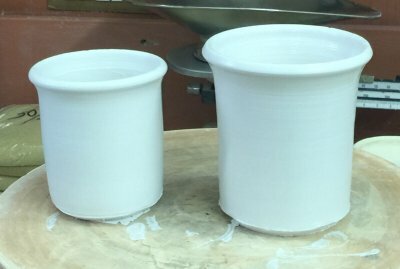 These crucibles are thrown from a mixture of 97% Zircopax (zirconium silicate) and 3% Veegum T. The consistency of the material is good for rolling and making tiles but is not quite plastic enough to throw very thin (so I would try 4% Veegum next time). It takes alot of time to dewater on a plaster bat. But, these are like nothing I could make from any other material. They are incredibly refractory (fired to cone 10 they look like bisqued porcelain), a have amazing resistance to thermal shock. I could pour molten metal into them and they will not crack. I can heat one area red hot and it will not crack. I can throw the red hot piece into water and it will not crack! This terra cotta cup is glazed with G2931G clear glaze (Ulexite based) and fired at cone 03. It survives 25 seconds under direct flame against the sidewall before a crack occurs. Typical porcelains and stonewares would survive 10 seconds. Super vitreous porcelains 5 seconds. This is an advantage of earthenware. Sudden changes in temperature cause localized thermal expansion, this produces tension and compression that easily cracks most ceramics. But the porous nature of earthenware absorbs it much better. During initial testing I found better performance for glazed earthenware (vs. unglazed), but in later testing they proved to be fairly similar. The TSFL test on consistently size tiles can be used to log more precise results. The porcelain is harder, but the terra cotta has it beat for thermal shock! 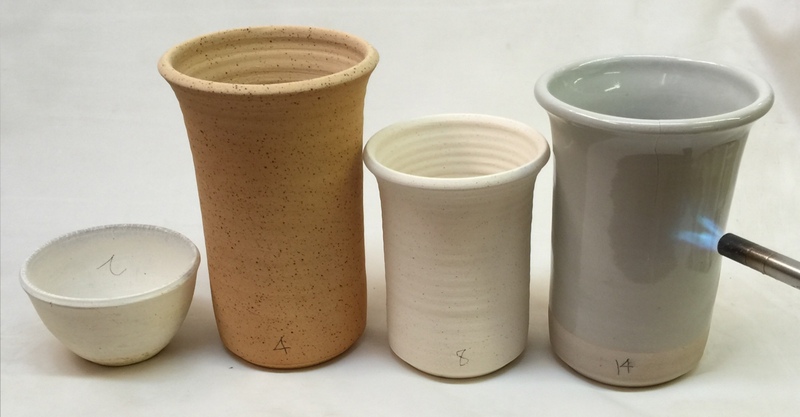 This terra cotta cup (center) is glazed with G2931G clear glaze (Ulexite based) and fired at cone 03. It survives 30 seconds under direct flame against the sidewall and turns red-hot before a fracture occurs (the unglazed one also survived 30 seconds, it only cracked, it did not fracture). 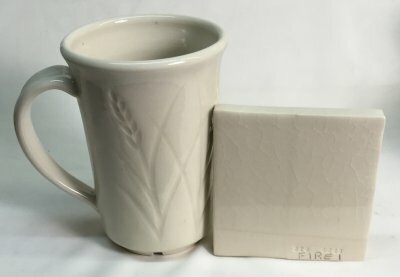 The porcelain mug (Plainsman M370) is glazed with G2926B clear, it survived 15 seconds (even though it is much thinner). The porcelain is much more dense and durable, but the porous nature of the earthenware clearly withstands thermal shock much better. It is actually surprisingly durable. Same body, glaze, thickness, firing. Same thermal shock. Only the tile crazed? Why did the glaze on the tile craze? It is double the thickness of the walls of the mug. 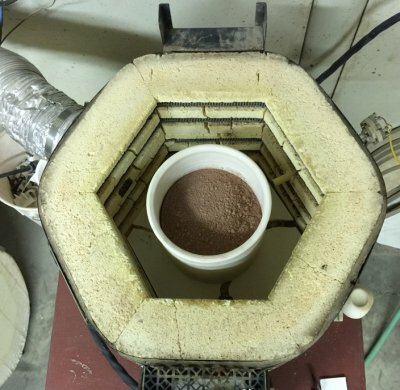 Thus, when quenched in ice water (BWIW test), a greater gradient occurs between the hot interior of the clay and the rapidly cooling surface. Left to right (all fired at cone 10): Pure 200 mesh kaolin vitrified at cone 10 cracked in two seconds. Next is a 42 mesh more refractory ball clay, it failed in four seconds. A refractory halloysite/kaolin material failed in eight seconds. A white glazed stoneware failed in 14 seconds. The cup on the left is raw, unground, ball clay (Plainsman A2 fired to cone 10 reduction). It cracked under a flame in only 4 seconds. The 200 mesh version on the right lasted 14 seconds (it is broken because I dropped it). It would appear that the larger quartz particles in the material on the left are imparting much less resistance to thermal shock failure. 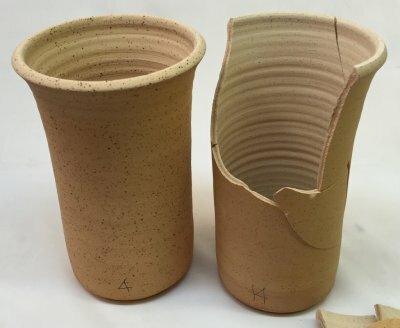 Low fire terra cotta mugs have cracked. Why? The white glaze is under compression, its thermal expansion is too low (that is why it is also shivering off the rim). As the piece is cooling the kiln the thick layer of white glaze first solidifies. As cooling proceeds the body shrinks (thermally) at a faster rate than the glaze. The puts the glaze under compression and stretches the body. As some point (e.g. last stages of kiln cooling, a thermal stress during use) the body cracks to relieve the stress (notice how the white glaze is pushing the cracks apart). Neither the body or glaze are at fault, in this case they are simply made by different manufacturers and are thermal expansion incompatible. One solution would be to mix it with a white glaze that is crazing (the opposite problem). Or you could add some nepheline syenite to the glaze to increase its thermal expansion (maybe 10% by dry weight). These are fired at cone 10R. The kaolin bowl on the left survived 2 seconds! The ball clay next to it: 4 seconds. The Helmer clay (halloysite/kaolin) next to that: 8 seconds. The white stoneware piece: 14 seconds. A commercial stoneware mug could survive for 50 seconds or better. 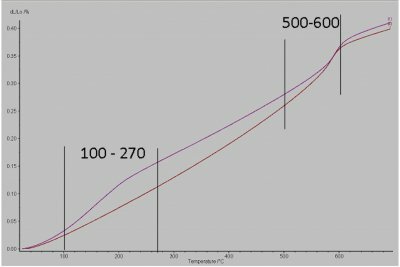 Thermal shock resistance is a complex subject. Of course, the size, thickness and contour of the ware are important. But many other factors come into play: quartz particle content and size, degree of maturity, thermal expansion of the matrix, homogeneity of the matrix, presence and fit of the glaze, internal structure of the mineral species (if the ware is not vitreous), their particles sizes and shapes, presence and type of aggregate (or grog), brittleness of the matrix, and more.